My month has been brightened! 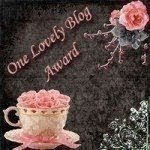 I have had such a pleasure of receiving a "One lovely blog" award. Thank you so much Debbie from Maple Spice. It's a wonderful feeling to be given appreciation in this way. Don't you think? It spurs me on more....inspirations are in overload! I've been coming up with all sorts of dishes...I haven't cooked them all but have them lined up, stored in my imagination waiting to burst out! Elise from Simply Recipes has a very well established blog! Her blog has a wonderful layout and tends to always have a recipe (or something inspiring) for the dish I happen to be researching! This blog is standing strong!! Kevin from Closet Cooking seems to be one of most favoured food blogs amongst many food bloggers, and it's easy to see why. His recipes are so creative and his imagery is lovely. Just go and see for yourself. And finally, a fellow Vancouverite, from eat me, delicious has delicious recipes from so many useful categories. Her wonderful photos look as though they give the dishes justice! You really should pay a visit. Congrats on the award! It is well deserved and I look forward to reading more. Thanks for the award!